Psectra diptera, from MacLachlan (1868). Psectra diptera is found in both Europe and North America but is apparently nowhere very common (a live photo can be seen here). Gunnar pretty much gave the reasons for identifying this insect as a lacewing in his comment: the high density of veins (particularly cross-veins) in the wings and the long, filamentous antennae (but lost out on the marks by assuming that it must be a fossil). Of course, lacewings normally have four wings, not two. Many basic references on insects will indicate that the only group of insects with a single pair of developed wings* is the Diptera, the true flies, but diptery is also found among Strepsiptera, mayflies, scale insects, lacewings, Psocodea and snowfleas** (and probably a couple of others that I've forgotten). Different processes seem to have resulted in wing loss in different lineages—among lacewings and psocops, for instance, it is associated with loss of flying ability, but Diptera and mayflies are capable of aerobatics that few other insects can rival. *Technically, Diptera do still have their hindwings: they've been altered into small knobbed rods called halteres. Hindwing halteres are unique to flies among living insects. 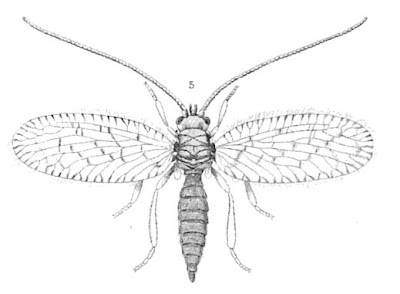 Strepsiptera have the forewings altered into halteres; scale insects have knobless filaments called hamulohalteres; and hindwing halteres were present in the Cretaceous lacewing Mantispidiptera. **Though the appendages of male snowfleas are just so freakishly bizarre (as described in the linked post) that I rather feel calling them wings is a little like calling a whale's flippers 'legs'. It may be correct in an evolutionary sense but it's a little ridiculous by any other measure. As noted by the commenter 'Reprobus', Strepsiptera are a little different from the other entries in the list in that they have lost the forewings instead of the hindwings. Relatively few groups of insects have larger hindwings than forewings: Orthoptera (crickets and grasshoppers), stick insects, earwigs, some beetles. All of these have the forewings protectively hardened to some degree, and in earwigs and beetles the forewings have become entirely hardened into protective cases called elytra. The evolutionary affinities of Strepsiptera are decidedly contentious (see the post linked to above) but some authors have suggested a relationship to beetles (and one recent molecular study has provided further support for this relationship: Longhorn et al., 2010). If so, strepsipterans may have been derived from ancestors that also had hardened forewings that were no longer functional when flying, potentially explaining why that was the pair that was lost. Longhorn, S. J., H. W. Pohl & A. P. Vogler. 2010. Ribosomal protein genes of holometabolan insects reject the Halteria, instead revealing a close affinity of Strepsiptera with Coleoptera. Molecular Phylogenetics and Evolution 55 (3): 846-859. MacLachlan, R. 1868. 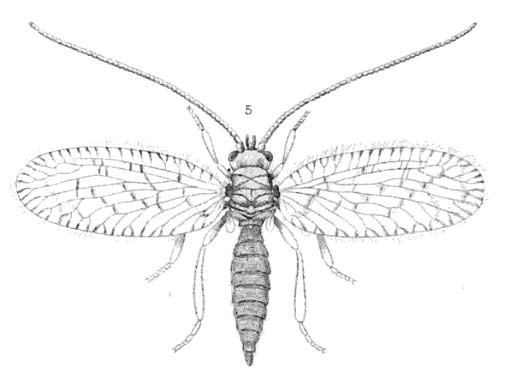 A monograph of the British Neuroptera-Planipennia. Transactions of the Royal Entomological Society of London 1868: 145-224. A beetle researcher whose name is 'Longhorn'? Oh come on now, what's his/her real name? "Diptera and mayflies are capable of aerobatics that few other insects can rival"
Interesting; I've never thought of this issue from that perspective. Are there any comparative studies that link the evolution of diptery in insects with improved flight performance (e.g., better manouverabilty)? Hi, what is the copyright status of that photo? If it's really been created in 1858, then it entered public domain and I could use in Wikipedia. Thanks. The date's 1868, not 1968. Sorry for the typo.